Instant photography exploded in the 1970s – and Kodak, watching from the sidelines, was itching to get in on the action. 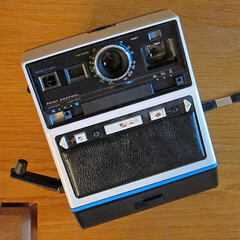 Polaroid introduced its its SX-70 instant camera in 1972. They were a revelation: you pressed the button and the camera spit out a print that developed before your eyes. Soon, Polaroid offered an entire line of these cameras, and sold them by the boatload. Kodak watched jealously, and plotted. They didn’t want to just make cameras that used the Polaroid films, even if Polaroid would let them. They wanted to own the films, too. So they developed their own instant film and cameras, and began selling them in the mid 1970s. Kodak made cameras in two form factors, both of them large and ungainly. 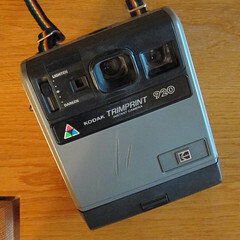 These two cameras from my collection, the EK6 and the Trimprint 920, are of the second, later form factor. The first form factor was wider and had a large handle on the side. The less-expensive cameras, like the one on the left, featured a crank for manually pushing the exposed photograph out of the camera. Higher-end models, like the one on the right, used a battery-powered motor to eject the photo. This Kodak commercial from 1977 shows a camera of the other form factor in action. Kodak’s instant film was similar to the SX-70 film in how it worked. Polaroid had patented its SX-70 film, so it sued immediately. Polaroid won – but not until 1986, by which time Kodak had sold about a bajillion instant cameras. The settlement was enormous, setting Kodak back upwards of a billion dollars. Also, Kodak had to stop making instant film and cameras, and offer its instant-camera customers fat discounts on new Kodak non-instant cameras. Those who claimed their settlement had to pry the nameplate off their cameras and mail them to Kodak as proof of ownership. The camera above on the left is missing its nameplate; it was glued to the white areas in the middle of the camera’s face. You’ll still find gobs of these cameras around; they’re useless and have no collector value. I bought a Kodak instant camera at a yard sale when I was a kid, when film was still available. In 1982, I put one pack of film through it – only one, in part because it was very expensive (north of $10 a pack), and in part because the camera wasn’t much fun to use. I remember the camera being clumsy to hold and very susceptible to shake. Every photo in the pack I shot was at least a little blurry. I also remember it being critical to crank the print out quickly at a consistent cranking speed so that the developer would spread evenly across the print. It was interesting to try the camera, but these quirks and limitations were enough that I never used it again. 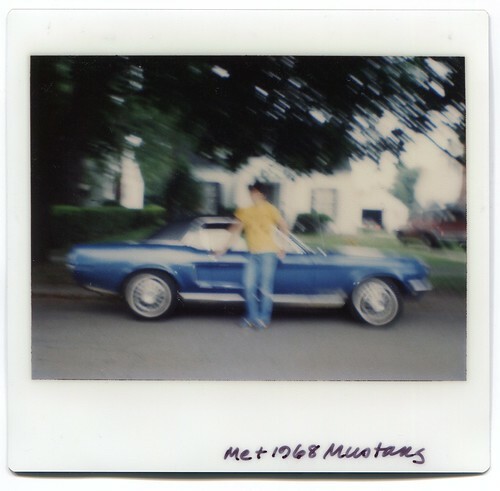 The only print I still have is one of me standing by a neighbor’s 1968 Mustang. The neighbor boy who took the shot was not careful to hold the camera steady, which is why the photo is so blurry. 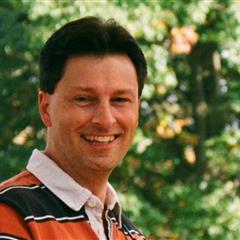 Despite the camera’s unpleasant quirks, the color fidelity was and remains very good. I have one SX-70 print from 1978 that has held its color too – but the colors have “that Polaroid look” and aren’t quite as realistic as those on this Kodak print. Even though the Kodak instant film used a similar process to the Polaroid film, the prints could hardly be more different. The Kodak prints were 4″ by 3 7/8″ with a rectangular, landscape-oriented image and a matte surface. In contrast, the Polaroid prints were 3½” by 4¼” with a square image and a glossy surface. Also, the Polaroid prints were set in a paper frame, while the Kodak prints featured the matte-finished material across the entire print surface. Another difference between the two films was that the SX-70 films were exposed on the front of the print, while the Kodak films were exposed on the back. So the Polaroid cameras needed a mirror to flip the image right side out, while the Kodak cameras didn’t. But SX-70 prints shot out of the camera print-side out, while the Kodak prints went back-side out. Later Kodak instant cameras and film offered a feature called Trimprint, where you could peel off just the rectangular image. The resulting print looked rigid like a regular film print, at least in the ads. I never got to shoot Trimprint film so I don’t know for sure. I do know that Polaroid never offered anything like it. I’m sure Kodak knew it was gambling with its instant cameras and film; they were just too similar to Polaroid’s SX-70 system. Now they’re little more than a photographic footnote. such as my Automatic 250. See it here. Actually, Kodak did not produce any time-zero film as Polaroid set up its plant in Waltham MA to produce everything. The two other plants were in Ireland and the Netherlands. They closed the Irish plant in 1982 due to overprojection of film sales. Kodak made the negative base for the peel-apart films, but even stopped doing that around the 1970s. Many of the Kodak instant cameras one finds have had the Kodak badges removed as part of the settlement with Polaroid. I think the Fuji instax films are pretty similar to the Kodak process. Hunh. Thanks for the correction. The source I found said that Kodak made the SX-70 films at first. I’m sort of interested in the Instax cameras, out of idle curiosity. I’m reading yet another book about Polaroid, mostly about its demise after Land was forced out of the company. It’s written by someone that worked there for 20 years, and has been a fascinating read so far. I would love to read more about Land and his company. Of course, my reading list is already a mile long. My mom had one of these! Extremely bulky by today’s standards, but I remember thinking it was so much cooler than the Polaroid 600 cameras that ended up replacing it. The Polaroid cameras were bulky too, but at least to my hand hey were less unwieldy. Sounds like I didn’t miss much by having never used this system. I have one of these that came in a box of stuff. And I have to agree that it looks like it would be unwieldy. Yup. Hard to hold, hard to keep steady. I’m not sure what to do with these two cameras. They came in a box with a bunch of others that were way more interesting to me. I’m running out of space to store cameras and will have to thin the herd soon. I am in the same position with needing to do some thinning. Haven’t decided what criteria I will use. I remember when the Kodak instant cameras came out; my reaction was the same as yours. It looked really bulky and like it would be hard to use. I had an SX-70 at the time. My parents gave it to me for a graduation gift in 1975. Used it for several years, but like you said, the colors weren’t very good, and the pictures just didn’t look that great. I finally ditched it for a 35mm SLR in 1982. Still have the SX-70 on a shelf in the bedroom closet, though. The SX-70 is iconic and worth saving. I have one here that I plan to shoot for the first time soon. You know it’s crazy Jim but I never even used one of these and I am getting pretty old, I don’t ever remember my siblings or parents ever even having a camera. Therefore very few family pics,kinda sad. They were so expensive! My mom documented my family’s lives with an Instamatic — lots more cost effective. I’m redoing my old photo albums and have gotten up to the instant camera ones and they take up a lot of room so I was wondering if it’s safe to cut around them to save space. I tried one and it looks sealed up, but hesitate, wondering if maybe I’ll ruin several pages. The pictures are really clear, but maybe I threw out the poor ones! Thank you for any information. I’ll check back. Ann H.
Hi Ann – I wouldn’t cut any of the integral-film prints. Those are the ones with the big white tab below the image. I believe all of these prints are made of layers of paper and the layers separate when you cut the borders off.